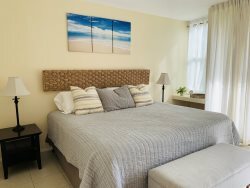 Newly renovated 1 bedroom, 1 bathroom spacious ground floor, corner unit condo located in gated community at Turtle Bay Resort. New cabinetry, granite counter tops, screened in lanai, comfortable furnishings, flat screen TVs with smart TV in the living room, A/C in bedroom, high speed wireless internet access and DVR cable box in the living room. This condo has a full size washer and dryer as well. Condo is fully stocked with linens, bath and beach towels and all kitchen needs such as a coffee maker, blender, dishes, pots, pans, etc. One off street, secure parking space is included. This unit is the closest to a beautiful heated pool.